Taste the sunshine. 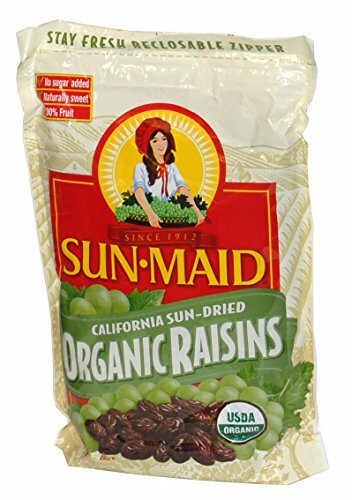 Our organic raisins are exclusively grown by Sun-Maid's certified organic growers. These growers meet the strictest standards for organic agriculture. Once our organic California Thompson Seedless grapes have reached their maximum sweetness, they are harvested and sun-dried to perfection. Just one-quarter cup (about 1.5 ounces) of Sun-Maid Raisins equals one complete fruit serving. Our Sun-Maid raisins are naturally sweet -- no sugar added. Use to: bake cookies, snack anytime/anywhere, add to cereals, blend in yogurt, flavor vegetables, mix in salad, enjoy 100% fruit goodness. If you have any questions about this product by SunMaid, contact us by completing and submitting the form below. If you are looking for a specif part number, please include it with your message.